UPDATE: All lanes on Highway 17 reopened and CHP lifted Sig alert at 2:35 p.m. Tuesday. Highway 17 just north of Redwood Estates in unincorporated Santa Clara County was shut down Monday afternoon due to a brush fire, according to the California Highway Patrol. Both northbound lanes and one southbound lane were reopened Monday evening, but it appeared the other southbound lane would remain closed most of the night as firefighters remained on the scene. 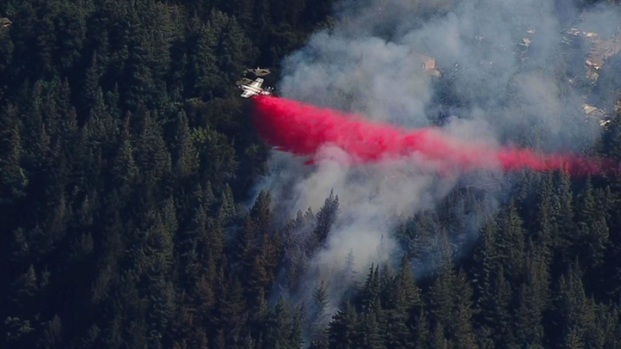 The fire, which started about 3 p.m., spread quickly to about 2.5 acres, according to Cal Fire, which was battling the blaze from the ground and air. At one point, about 30 structures were threatened, fire officials said, and some residents along Oak Road began voluntary evacuations. But the fire was contained quickly, and its forward progress was stopped about 4:30 p.m., the Santa Clara County Fire Department said. The blaze started as a vehicle fire on the highway and spread to the brush, the CHP said. No injuries were reported. Electronic signs alerted motorists to the road closures, but many like Greg Geiser were already stuck in the traffic mess. "It's always bad when there's a fire but what can you do?" he said. "I think we're just going to turn around and go back home."